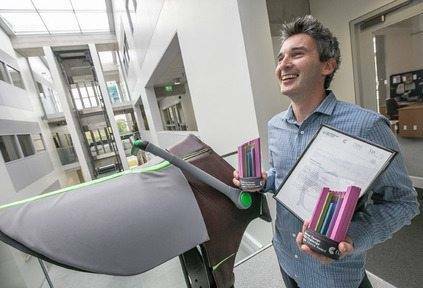 A product design graduate of Institute of Technology (IT) Carlow, Jack Gregan, has won the top three awards at the Universal Design Grand Challenge (UDGC) student awards for his design for a therapeutic aid that can be used in equine therapy for children with autism. Currently an intern with Carlow IT’s DesignCore design research centre, Gregan won the UDGC People’s Choice Award, the UDGC Judges’ Choice Award and the Enterprise Ireland Universal Design Commercialisation Award for his ‘Go Therapeutic’ horse riding aid. His project is an alternative to a saddle, ensuring the stability of the rider while enhancing all the benefits of equine therapy. The solution is proving to work for many users outside of equine therapy. Part of Irish Design 2015, the UDGC is run by the Centre for Excellence in Universal Design at the National Disability Authority. It invites third level students in their final two years of study, post grads and recent graduates to enter their best student project to compete for two National Universal Design Student Awards and, for this year, the special optional prize of the Universal Design Commercialisation Award supported by Enterprise Ireland. Aside from the €1,000 in prize money for the first two awards, Gregan will receive funding of up to €15,000 to explore the marketing/commercial opportunity of his winning entry thanks to the commercialisation award.